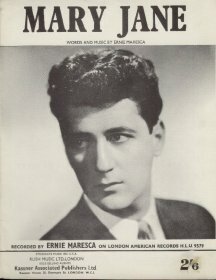 Almost from its inception in 1958, until its demise in the 1990s, the name of Ernie Maresca loomed large in the story of Laurie Records. The Bronx-born Italian-American songwriter, singer, producer and sometime hitmaker started out hustling his demos to Dion and ended up running the company's publishing arm. Ultimately, he brokered the sale of the catalogue to Capitol in 1992 on behalf of Laurie's founders Gene Schwartz, his brother Bob and Eliot Greenberg. 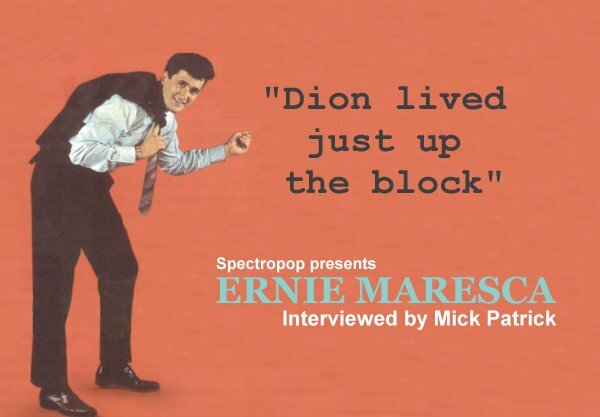 I had the good fortune to speak to Ernie on the phone a few years ago and took the opportunity to ask him about those halcyon days of the New York recording scene. How did you get into songwriting? Everyone knows 'Runaround Sue' and 'The Wanderer', but they weren't the first songs of yours that Dion recorded, were they? Dion lived just up the block. When I was 13 or 14, in those days, I used to like the Mills Brothers and the Hilltoppers. I used to love them. Joni James was my favourite. Then everything changed, you know. Luckily for me, rock'n'roll came along. We used to go to my aunt's house in New Jersey. We could get better reception there. That's where I first heard Alan Freed, the Moondog Show. And that was it. I'm going back to 1956 when I was 17. I had made a demo of 'No One Knows' and put it on a jukebox in a poolroom. He went up there and played pool and heard the demo. He wanted to know who the singer was. That was me. I lived about five or six blocks away. So we met and he liked the song. He said I should come down and meet Gene Schwartz. So I went downtown and met Gene and Bob Schwartz at Laurie Records. Gene liked the song but we had to change it. I lived on Garden Street. When we wrote it, it went, "On Garden Street where I come from, all the girls are a bunch of bums. We take 'em to the park each night, and da-da-da under the pale moonlight." (Laughs) Naturally, we had to change it. And they recorded it. It was the flipside of 'I Can't Go On (Rosalie)', but it became the hit. I think it went in the 20s on the charts. You wrote 'No One Knows' with Ken Hecht. I'm not very familiar with that name. Ken Hecht contributed a lot to 'No One Knows'. He was a nice guy. When I met him he was about maybe 60. But, you know, when you're 20, a guy of 40 can look 60. Later I cut a lot of sides at Seville and Ken wrote some of those with me too. After I had 'Shout! Shout! 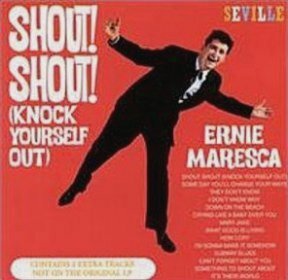 (Knock Yourself Out)', Seville put out an album, and I think Ken wrote one or two things on that album. But I never saw him again, ever. I think he's dead now. Eventually, Dion did 'Runaround Sue' and 'The Wanderer', your two most famous songs. I was just listening to your original demo of 'The Wanderer'. The next song by me Dion did was 'A Lover's Prayer'. I was cutting a lot of demos in those days. Everybody was singing in the neighbourhood, on the street corners and in the hallways. I was in a group called the Regents at the time. They didn't have a hit yet. Everybody was coming to me for songs, which was nice, you know. Dion liked the song, so he did it. I'd never even heard of Laurie Records until I went up there with Dion and met Gene and Bob who owned the company. After they put out 'No One Knows', I would go up there with demos. I used to cut a lot of demos, you know. Then they cut an album and on it they put 'Runaround Sue'. 'The Wanderer' was the flipside of 'The Majestic'. They just cut it as a throw-in and when it came out it was just a flipside. It turned out to be the biggest copyright I ever had. It was lucky that I kept the contact with Laurie, because other people, they didn't even want to see me. I showed 'The Wanderer' to everybody. They all turned it down and told me to forget about it. I lived in The Bronx and Laurie was midtown. They had two or three offices because they kept moving. I'd go like two or three times a month with demos that I had made. You had to bring a demo in those days. Studios were like $15 an hour. I guess it was a lot of money but you could cut two or three things in an hour. I'd bring an acetate up there and they would play it. I used to do a lot of them at Associated Studios and a lot at Allegro Studios. That was in the basement of 1650 Broadway. 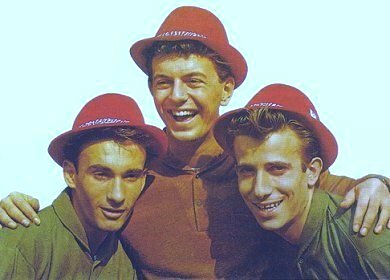 Laurie ended up owning Allegro but that was after 'Runaround Sue' and 'The Wanderer' and all those things. They were cut at RCA. Laurie probably bought it in the late '60s. Of course, you didn't just write songs, you sang them too. 'The Good Life' is a good one. And weren't you also Artie Chicago? 'The Good Life' is a great track, it really is, but not because it's me. That's Tony Faranda playing guitar. He was terrific, Tony. Sal Corrente called recently to tell me that Tony had just died. They were very good friends. Tony played that guitar lick on 'Rockin' Boulevard Street' and on practically every single record that I ever did. He was a bass player and a guitar player. He was fantastic. He'd just moved down to Florida and I was gonna get together with him but he passed away. Yeah, Artie Chicago, that was me singing lead with the Belmonts. I love that song, 'Please Don't Play Me A7'. It was written about a bar in The Bronx that we went to after recording sessions. I also met my wife Paula there. You mentioned Sal Corrente. Can you tell me a bit more about him. Sal Corrente is a cop and a real good friend of mine. He lives up in Yonkers. He was part of all kinds of groups, like the Johnny Law Four and the Traces. No (laughs), Johnny Law wasn't a real person. They used that name because they were all cops. Sal was the lead singer. He's been singing forever and he's still singing now. He's a nice guy and a rock'n'roll fanatic. He sings great. He sang at my wedding. He should've had a hit record years ago. He did things like 'Unbelievable' by the Runarounds. He sings lead on that, I think. That should have been a hit. It was on Nat King Cole's label but he died and the whole record died. Sometimes it's hard not to feel sorry for Carlo Mastrangelo of the Belmonts - always in Dion's shadow. You wrote a few songs for Carlo too. Carlo was a great, great artist. I just met Dion the other day in church and he told me that he copied me and Carlo. He told me he followed me on the demos and owes everything to me and to Carlo. Please (laughs). It was a very nice thing to say but, come on, he's so great. Carlo is unbelievable. He did a thing of mine called 'Brenda The Great Pretender' that was really good. It was written before Dion's 'Donna The Prima Donna' but it never came out. He lives in Florida. Dion tells me he's working in a bookstore, an antiques shop, but I haven't seen him in like 20 years. I cut a lot of sides with Carlo that should have been hits, like 'Ghost Man', 'Time Is Wastin'' and 'Stranger In My Arms'. 'Stranger In My Arms' - that's a great one. I wrote 'Stranger In My Arms' with Pete Baron. We wrote it for Carlo. Pete recorded for the Belmonts' label Sabina, a song called 'Look Out For Cindy'. That was a great record. I did 'Your Big Mistake' with Pete, by the Delrons. And 'Cry And Be On Your Way' by the Demilles, that was a good one. Pete Baron got killed several years ago. He had his own exterminating business. He called me one morning to go and meet him on Gunhill Road, at this music store. He'd cut a master and he wanted me to go and meet him. I told him I didn't want to because it was a bad neighbourhood. I wasn't seeing much of Pete at the time. Then that afternoon we heard that one of the Belmonts had been killed in The Bronx. We had no idea who it was. Pete wasn't an original Belmont but he used to sing with the group. The original Belmonts were Carlo, Angelo and Fred. Pete Baron used to sing with Dion and, every now and then, whenever a Belmont left, he would be a replacement for Angelo, who went in the Navy, or whoever. Anyway, he was in the store and two guys went in and just opened fire. They shot the owner and they shot Pete who happened to be there. Pete died and the owner survived with brain surgery. Pete was innocent of anything. The gunmen got away with $10,000. It was a music equipment store. It was terrible, really terrible. I still think of it to this day. Pete was terrific. Let me throw some more names at you please - Jimmy Curtiss. Jimmy Curtiss was a very, very talented guy. He shoulda had a hit record. 'Let's Dance Close' is a good track. He was absolutely terrific. He did all the backgrounds. A good writer, he wrote 'Child Of Clay' with me. I have absolutely no idea where he is. We tried to find him once because we had royalties for him. His real name is James Stulberger. Him and Carlo definitely should have had hits but that's just the way it works out. Even I had a hit but they were much better singers. I met the Five Discs through Joe Barcelona, one of the guys. I got them in the studio in Brooklyn, this guy had a little studio in his house, and we cut 'Rock And Roll Revival'. They came to Laurie with 'I Remember' in the '50s. Gene Schwartz picked up the master because RCA had turned it down, or something. I liked the group a lot. The Teardrops are very good friends of mine. As a matter of fact, Pauly sang at my wedding. They play in Atlantic City and Vegas but you gotta wait two hours to get in to see them, unless you know somebdy. They got a big Mafia following (laughs). They sing all Italian songs. They were two brothers but one of them died when he was only 38, or something. The remaining brother, Pauly, gave up because he was devastated. They were inseparable. Then he started singing again and he got another guy to join him. Things like 'Hey Gingerbread' and 'Champagne Lady' were recorded before the original brother died. They were a duo, Pauly Teardrop and Tony Teardrop. I don't know their real names. Something Italian, I guess (laughs). Frank Lyndon lives in Florida too. He was one of the Belmonts. He sang lead for them when Dion left and they couldn't find Carlo, or Angelo had went off, who knows. When I lived in New York, Frank Lyndon called me two or three times a week, but when I moved down to Florida, I called him about fifteen times and he never returned my calls. So you figure it out. Frank is a terrific singer. 'The Hat'? What a great song. He also did 'Santa's Jet' on Laurie, a novelty. It's one of my favourite records. Warren Gradus - you and he wrote 'The Spirit Of Woodstock', which you recorded. 'The Spirit Of Woodstock' is a good song. Warren Gradus sings with the Belmonts now. I wrote a lot of songs with him. He has his own studio in his house. I haven't seen Warren since I got married about five years ago. He's a very good writer but he never had a hit. That's because a lot of things never came out. The Demilles - 'Cry And Be On Your Way' is a good track. The Demilles were Fat Davy and Snoopy and those guys. I saw Davy last time about seven years ago. He was living in New York. We used to call him the Alfred Hitchcock of the music business. He sang background on every record. He did basically all of the background work for Laurie. I think he also sang sometimes in the Regents. If you ever needed a false tenor, you always got Davy. Dave Banks was his real name but we used to call him Fat Davy. He used to ask why we called him fat. I told him to look in the mirror! He's a nice guy. The Demilles had a bunch of names, like the Camerons. The Harps - they recorded 'Marie', one of your songs. 'Marie' by the Harps was cut by Billy and Steve Jerome, who also cut Reparata and the Delrons. They loved the songs that I wrote. They were nice guys. They had a studio, I think it was out in Brooklyn. They came up to Laurie and played them a few things. One of them was 'Marie', which Laurie took and put out. It was through them Laurie got John Abbott. He was the arranger on Dion's 'Abraham, Martin And John'. The Brooklyn Boys were another of the Jeromes' acts. I wrote 'The Normal Ones' with Lou Zerato. I met him through Steve and Bill Jerome too. They brought the group up to the Laurie office and we cut them. But that one never came out either. I wouldn't know them if I saw them now but they were nice kids. Lou Zerato - you and he wrote quite a few songs together. I did a lot of writing with him. We wrote 'Party Girl' for Bernadette Carroll, 'Hey Jean, Hey Dean' for Dean and Jean, 'Up On The Bridge' for the Chiffons. He was a great guitar player and a nice guy. I didn't really know him that well. When I started out at Laurie, he was one of a bunch of guys who used to come up every day. We would have fried egg sandwiches and just write for ten hours a day. I'm surprised they didn't throw us out of the office, the noise we made. But if they had paid more attention to us, they would have had more hits. I wrote a lot of good songs with Lou. He moved out to Colorado or somewhere like that. Dean and Jean are special favourites of mine. They recorded some of your songs, like 'Seven Day Wonder'. How well did you know them? Jean was a wonderful woman. Both of them were really good people, I'm telling you. They were really down to earth people. I really, really liked them a lot. I got along with them from day one. I'm sorry to hear that Jean died. Brenda Lee Jones was her real name. I wish she would have called me because she probably had royalties coming to her. 'Seven Day Wonder' was written with a good friend of mine named Andy La Terra. He was the other writer on that song with Lou Zerato. Andy sang at my sister's wedding about 30 years ago. He's a lounge singer at a club in New York, sounds just like Frank Sinatra. He's terrific, a nice guy. Tom Bogdany is a great guy. He wrote 'Shout! Shout! 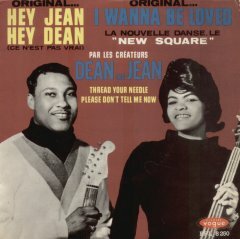 (Knock Yourself Out)' with me and 'Please Don't Tell Me Now' for Dean and Jean. 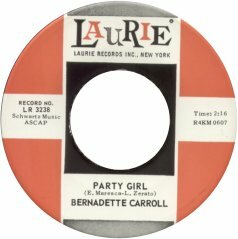 Bernadette Carroll made a lot of good records too. Bernadette Carroll was a doll. She did a few of my songs, like 'Hold Back The Light Of Dawn', 'Party Girl' and 'Try Your Luck'. Somebody else did 'Try Your Luck', in Italy, and it went to #1. Bernadette should have been a star, she was pretty good. Didn't she and I record a duet together too? Yes you did, 'Tell Him For Me' - it came out on an LP. How about the Four Coins? I got to know the Four Coins through Danny Kessler at Seville when I cut 'Shout! Shout! (Knock Yourself Out)'. In later years they contacted me and I cut a few things with them like 'Try Your Luck' and 'I'll Never Love Again'. That was a good record but it didn't get promoted. They pressed things but that was about it. One more - Hoagy Lands. I'm not knocking the label, because I was part of it. They tried to get into black music and things like that, but they couldn't do it. The only act they had was Hoagy Lands. I cut a thing with him called 'Happy Go Lucky'. We did it at Allegro in about 1967. I kinda wish they'd released it as a single because I thought it might have done something, but it never even came out. I used it later on a compilation. I heard Hoagy died. He was another great guy. He was terrific, a real talent. He had a following in Europe, didn't he? You ended up working at Laurie Records fulltime. How did that happen? I was really a hustler, trying to show my songs. I had good songs and I was there at Laurie regularly. Eventually I became friends with Gene and Bob. I was like 19 and they were like 35-years-old. They were good people. One day Gene asked me why I didn't go and work for them and handle the publishing, or whatever. So I started working up there and I got in close with Bob, Gene and Eliot Greenberg. I got right in there. It's kind of a miracle, to be honest with you. I ended up selling the record company for them to Capitol in about 1992. Then Eliot passed away and so did Bob. he also did a song of yours called 'I Got The Blues'. Remember that one? He did that on an album. My demo on 'I Got The Blues' was so fantastic, but we can't find it. As a matter of fact, I was just talking to Dion about it the other day. He only lives about five blocks from me now, here in Florida.